It is often quite important to keep track of the weight of a patient. It may be necessary to make sure that they are receiving proper nutrition and are gaining weight appropriately, or not losing any weight. The patient’s weight may be an indication that they are retaining fluids, and need to receive medical attention. There are many doctor’s type scales that are appropriate for this purpose. The patient need only step onto the scale platform to determine their weight. This becomes much more difficult for a patient who is confined to a wheelchair. In some cases, they may be able to be wheeled to the scale, and then stand up to stand on the platform. Often, though, they may not be able to stand at all. A wheelchair scale must be used in this case. There are a number of scale specifications that may determine their usefulness as a wheelchair scale. Wheelchairs come in many different sizes, including compact models and more standard units. There are also special models for bariatric patients, which can be quite large. The platform of the scale must be large enough to accommodate the largest size wheelchair that may be encountered. The platform size may be as small as 27′ x 30′ for the most compact chairs. More standard sizes range from about 30′ x 36′ up to 33′ x 39′. Special large sizes can be as large as 36′ x 44′. The capacity of the scale is also important. Even the smallest electronic scales have a capacity of about 400 lb, which need to account both for the weight of the wheelchair and the patient. The larger digital scales have capacities in the area of 600 lb to 800 lb, with some models even going as high as 1000 lb. The accuracy and the resolution, or smallest readable increment of the scale is also important. Some of the scales will allow readings with increments of 2 tenths of a pound. The more accurate units, such as those from Arlyn Scales, will actually display increments of 1 tenth of a pound. This often allows the health providers to be alerted quickly and early to any changes. While the platform size is important, the height of the wheelchair scale platform is also important. The lower the profile of the scale, the easier it will for the wheelchair to be moved onto the platform. Furthermore, a low profile scale will not need as long of a ramp, limiting the amount of floor space that is required. 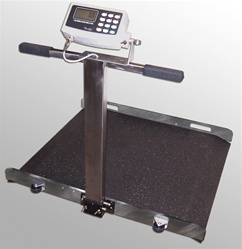 Most of the wheelchair scales incorporate four load cells into their design. The load cells are attached to the bottom of the scale frame. They sense the amount of weight on the scale platform and convert the weight to an electronic signal. Arlyn Scales provides machined pockets in the frame of the scale to accommodate the load cells. This provides a significant overall reduction in the height of the scale. In addition, the load cells are well protected inside the pockets. The material that is used to fabricate the load cells will also affect its properties. The most commonly used material is aluminum. It has the benefits of easy fabrication and low cost. But it is not as rugged as some of the alternatives. Whereas most load cells can be protected from excessive loads, it is impossible to protect them from shock abuse. In the case of a wheelchair scale, if it is impacted from the side by another wheelchair, while fully loaded, it is quite easy to damage the load cells. One alternative to the aluminum is nickel plated steel. This increases the shock load capability. The best choice, though, is stainless steel. When the appropriate alloy material is fabricated and is then subjected to a special heating and annealing process, it will produce much better shock load performance. This is the type of load cell used by Arlyn Scales. While aluminum is not the preferred choice for the load cells, it is ideal for the construction material of the scale itself. It will not rust, is very strong, and very light. This allows the wheelchair scales to be easily moved around the facility. When not in use, the scale may be turned on its edge for storage, greatly reducing the amount of floor space required. A welded aluminum scale will provide years of constant use. The digital indicator must provide a clear, easy to read weight value. While most digital displays consist of numeric digits, the best scales provide a graphics screen. Not only are the digits large and bold for easy reading, but they provide menu choices to prompt the user through the various functions.